You know you have that extra special person in your life that want to send flowers to this Valentine's Day. Let Teleflora take care of that for you. I received the stunning Swirling Desire Bouquet and it is absolutely beautiful. Make this Valentine's Day one to remember with this stunning art glass piece, wrapped in a ribbon of crimson glass and filled with fabulous flowers! 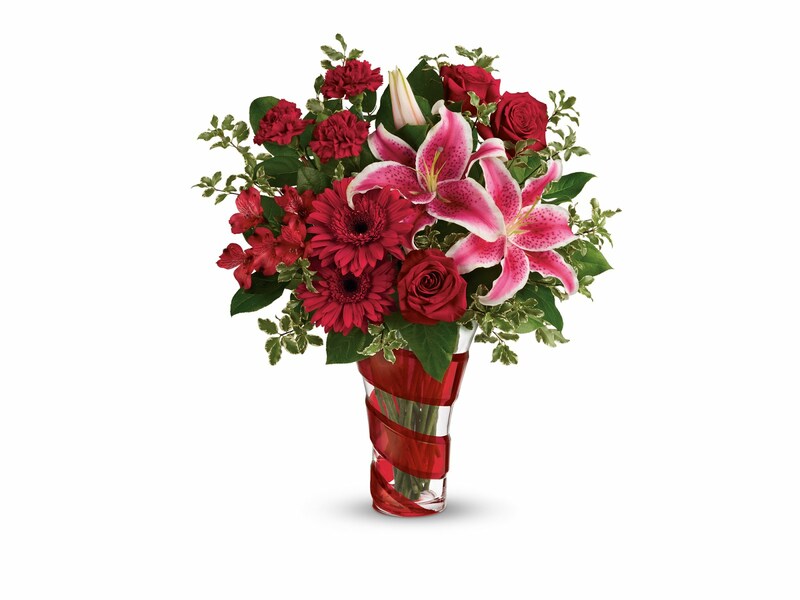 This bouquet contains red roses, hot pink oriental lilies, red gerberas, and red carnations are arranged with pitta negra and lemon leaf. The vase is beautiful and very heavy. I will definitely be repurposing and reusing this vase. I love that I can use these vases from Teleflora year round and for years to come. 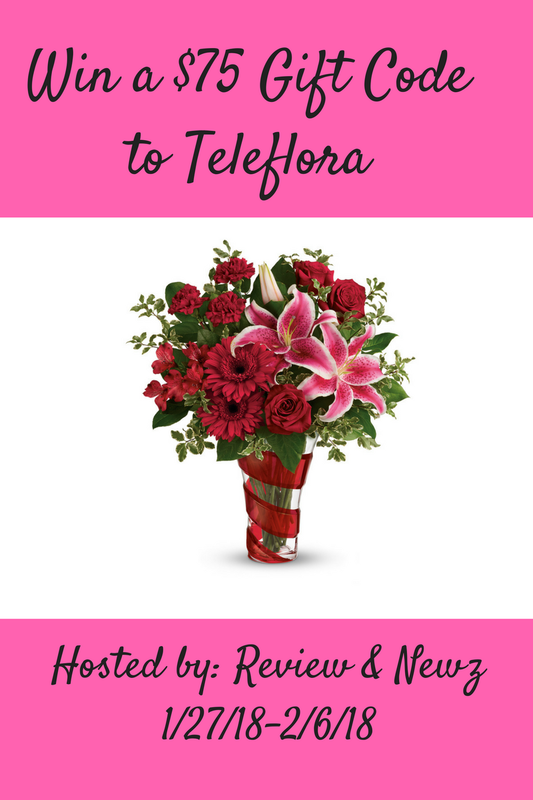 One of my lucky readers will win a $75 gift code to Teleflora. · Valued at $75 USD, plus free delivery service fee included. · Expires on February 12, 2018. · Good on Teleflora.com; no cash value. · Not valid on sale items. · Coupon cannot be combined with any other discount or promotion codes. · One time use only. If I won, I'd get a bouquet for my dining room table! I would gift to my daughter!! Her birthday is coming up! Thanks! I would send it to my grandma who turned 90! If I won, I would send a bouquet to my grandma for Valentines Day! She is in the local nursing home and would love to get some beautiful flowers! I'd give a bouquet to my sister for her graduation coming up! She's worked so hard. If I won, I would send a bouquet to my mother. She loves having fresh flowers in her house! Oh I would love to send it to my mom for Valentines day! I would send a bouquet to my mom. I would love to give a bouquet of flowers to my wonderful mom! If I won, I would keep the bouquet for myself. I would give a bouquet to my Mom. I would give the bouquet to my beautiful mom! I would give it to myself/and my fiance and put it on the kitchen table. I would love to send this to my mom for Valentine's Day. I would give the bouquet to my sweet daughter. Well, I have no one to send me flowers this year, & I need something to brighten up this gray Winter. I might just keep this for myself, lol. If I won I would give them to my mom! Winter is cold, snowy and full of illnesses like the flu and colds so my family hasn't been able to visit since Christmas Eve. I miss my mom and we hope to visit her soon. It would be great to have flowers to send her. I would use this to send my daughter flowers for valentines Day, She is in college in a different state and I know that flowers would make her day. I would give it to my mother. She would be overjoyed. I would send the flowers to my husband he really deserve he has taken care of me for so long while I have been sick! I just want to give him a little something to show I really am Thankful and I Love Him! I would send it to a dear friend as a thank you. My beautiful mom who just retired!! This would be wonderful!! I would keep them for myself. Got a big birthday coming up on the 20th, and roses remind me of my mom. If I won, I'd give a bouquet to my boyfriend's mom. She deserves it! I would send a bouquet to my mother. I would give a bouquet to my mom! She still does a ton for me! Honestly, I would keep it for myself. I would send to my mom for Valentine's Day. I would love to send some flowers to my mom! To my daughter and granddaughter who were in a bad car accident yesterday and are in the hospital. I would send some flowers to my Mother. Thanks for the chance to win such an amazing giveaway. I would give one to my best friend.